Like the previous two years, we have again made a report of what kept us busy during the year. We started the year with an escape from the European winter. 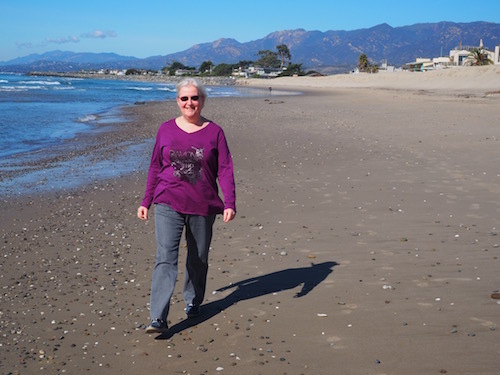 While José looked after Motek in Sage-Haast, we have been in California for two weeks. In Saratoga, we were hosted by our genealogy-friend of more than 10 years, Marcia Kaplan. 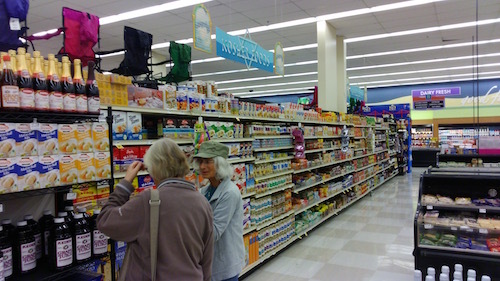 With her we explored the region, visited museums and went shopping for (kosher) groceries. 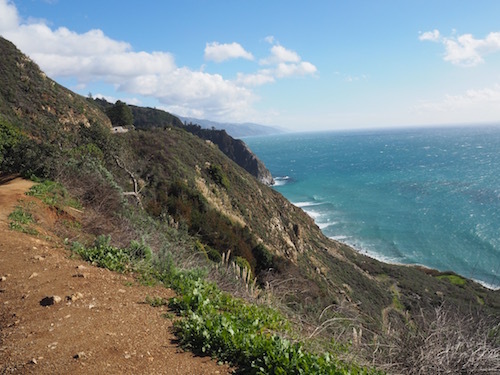 With a rental car we drove the Pacific Coast Highway from San Francisco to Los Angeles. 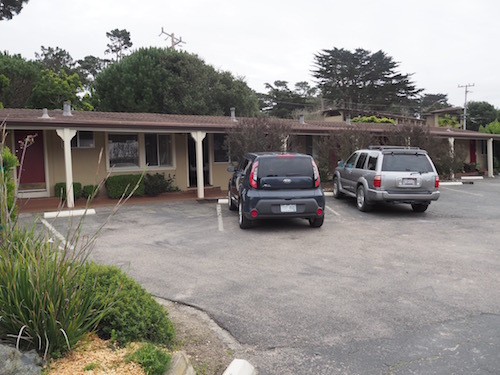 Along the way we slept in budget motels, which were all of excellent quality. The views were breathtaking at times. 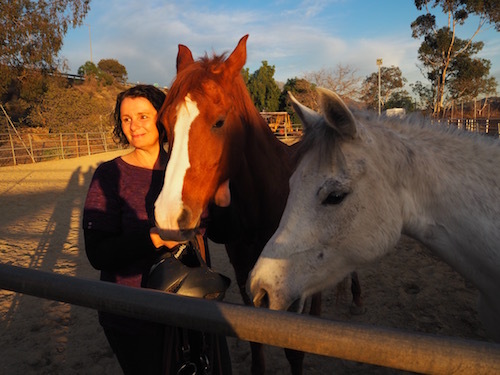 In North Hollywood we went to see Sylvia's friend Vera Sanon, who, besides designing complex knitting patterns, is engaged in rescuing discarded horses. It seems the animals realize to whom they should show their gratitude! In summary: a most pleasant 450 miles! 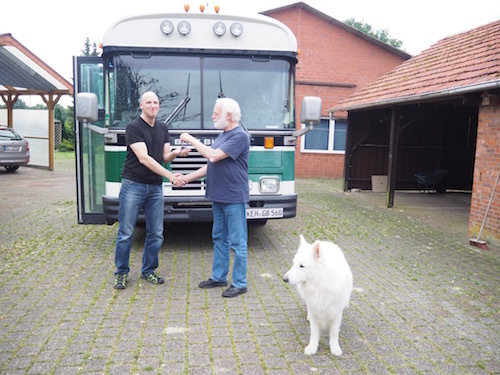 In May, on our way to our now traditional meeting in Bodenheim, we first spent a day at the DGS facility in Mainz in order to have the Allison gearbox of our Wanderlodge adjusted. It is wonderful to see these super-specialists at work. With an unprecedented smoothly shifting gearbox we went on to Bodenheim, from Mainz just a short distance. Like every year, the reunion with our many motorhome friends was heartwarming. Our "new" old-timer naturally attracted many visitors. In July, we decided - on a whim - that now it was time to combine pleasure with business: family visit and upgrade of our computer network, using the low exchange rate of the British Pound. 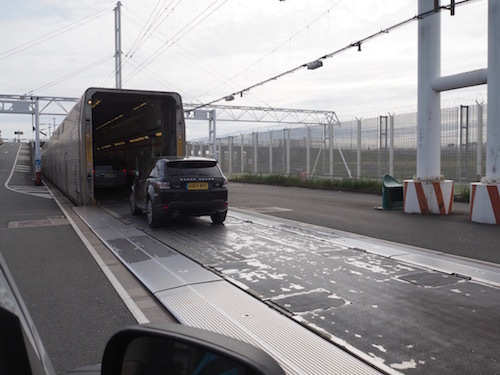 The trip went through Belgium and France to the Channel Tunnel, the only crossing in the Pet Scheme in which dog and owner can stay together. 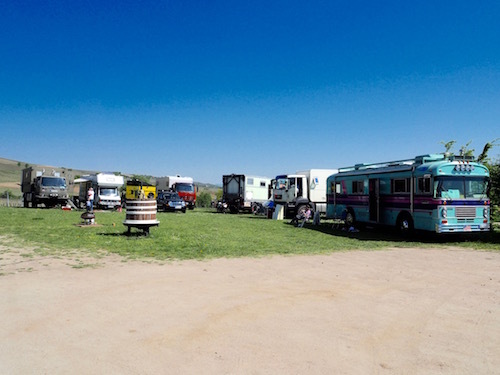 In the United Kingdom, boondocking is not common. 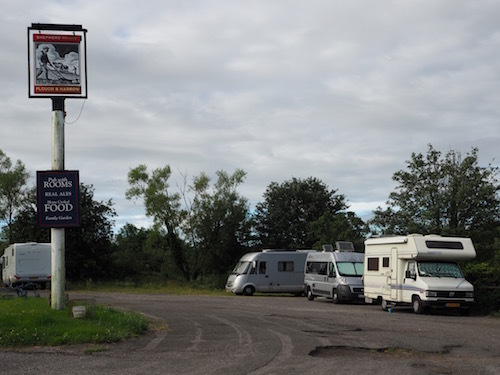 But many pubs offer an overnight parking. Obviously, in exchange having a few drinks or a meal is appreciated. But a visit to a 'real' British pub is definitely no punishment! At a campsite near her hometown Leighton Buzzard our cousin Christine comes to barbecue with us. Tesco's fresh salmon is perhaps the best ever! In the Apple shop in Milton Keynes we pick up our ordered and paid for new computers. When the staff notice that we live in Germany, but are born in the Netherlands, the mood instantly turns into quite amicable. In mid-August a classic campers meeting takes place in Den Helder. We set off in good spirits. Until .... in the middle of the Ems tunnel the steering behavior of the bus suddenly changed dramatically. An immediate thought is "flat tire", but the bus didn't pull to one side. By using both hands and his full weight, Ernst managed to keep the bus in lane, get it at walking pace out of the tunnel and into the first parking lot after the tunnel. The ADAC Yellow Angel who came on the spot, concluded with great certainty that there was a problem in the wheelhouse itself, and that towing away was the only option. Because of the size and weight of the bus we needed to a specialized company. The tow truck arrived a few hours later, along with a mobile workshop with an additional mechanic to disconnect the drive shaft. The tow truck driver looked under the bus for a second and pulled out a broken fan belt. So much for the professionalism of the German Roadside Patrol! So we spent the weekend not in Den Helder, but on the grounds of Autohaus Künnen in Meppen. Luckily the weather was fine. A nice neighbor who was concerned about our fate, even brought us a box of home-grown vegetables. On Monday, when the motor parts store was open again, a technician went for the correct belt (a normal European size) and mounted it on its pulley. That could have been Friday morning as well, which would have saved us a great deal of money. When we could drive again, we left for Rees, where we attended a small-scale reunion of Ernst's grammar school. On the weekly market we found a Dutch fish monger with raw herring. Something we sadly miss in Lower Saxony. Enjoying the nice weather we explored both banks of the river Rhine. 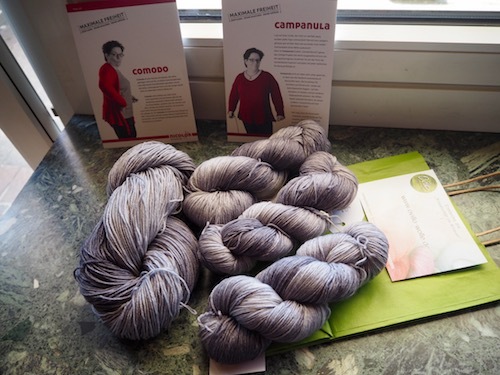 After a couple of very pleasant days we continued touring to the annual Yarn Festival in Sulingen. Here we managed to buy a gift for Sylvia's birthday. Note: the model on the patterns is not Sylvia. Throughout the year we made several more trips, often with the little campervan, including one to Ost Rhauderfehn where René and Linda had parked their the big DAF, to Elma's birthday party, to the Montferland municipality to renew a passport, to Ben in Alphen, to Scheveningen for Xandra's party and to the Asian shop and the optician in Emmen. During one of these trips we stayed at the Bonenstee camper ground in Nieuwlande, where we saw the impressive construction progress in Fred and Egbertje's new trailer-home. Furthermore, we visited the Mensa veterans' meeting in Utrecht, Arno's bar mitzvah celebration in Tilburg and the Limmud meeting in Deventer. As we have done for the last 15 years, we also went to the Camper and Caravan Exhibition in Düsseldorf. With a group of members of the Jewish community in Oldenburg Sylvia went on an excursion to Jever and Neustadt-Gödens. On September 11, we could vote for the city council. 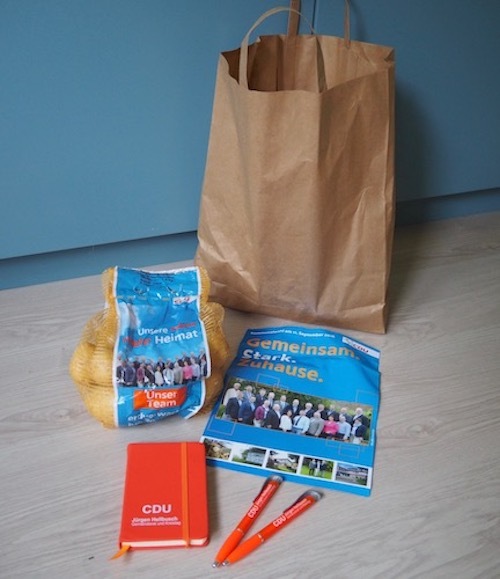 In the preceding days the christian democrats tried to buy our votes with some beads, mirrors and .... two kilos of potatoes. After voting ("You do not have to show an ID, because we know each other!") 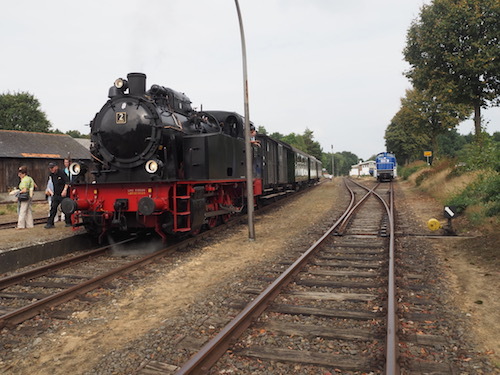 there was a railway party in Harpstedt. In March, the hearing professionals finally reached the optimal level of treble amplification. Ernst now understands a whole lot more. 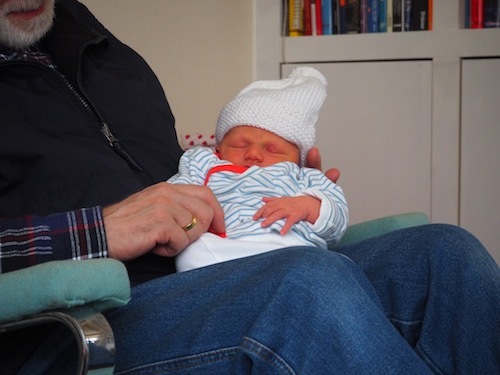 This year's highlight was the birth of Suze on March 16. Sitting on grandpa's lap is not enough to wake her up. Judith and Marcel came to see us in July with the kids! Sara and Abe are fascinated by Motek, though he sometimes is frightening, especially when he raises his voice. To mark the anniversaries of Abe and Sarah we went to Doorn and Driebergen. In September Tali and Danny stayed with us. We took them on trips to Varel and the Coastal Wetlands. 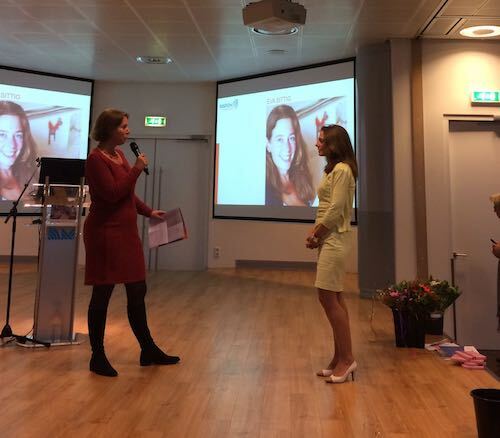 In early November we were in Utrecht, when Eva received an additional degree in youth health care. We apparently live in a healthy environment! This year we celebrated the 85th birthday of Else, the 80th of Elfriede and the 50th wedding anniversary of Inge and Manfred. In all these festivities, Sylvia in particular took part in the preparations, as neighbor, according to ancient tradition. 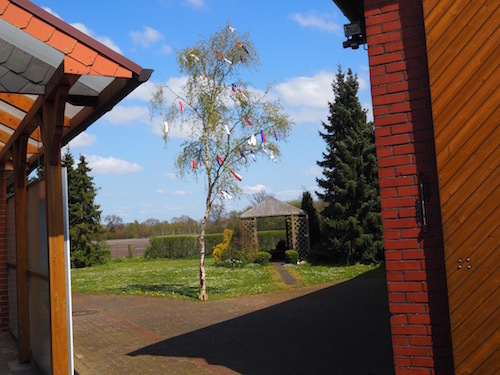 It was our turn for the First of May celebration this year. The small birch has been standing nicely until June 1st. 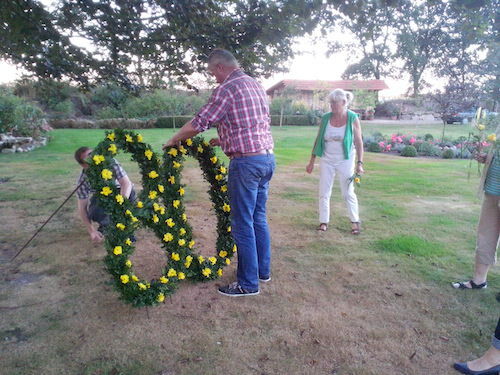 Also for the religious wedding party of Sabine and Uwe Syl has been busy with the decorations. For the first time we have hired the services of two garden women. They have been pruning for a few days and then everything looked a lot tidier. For this sick oak help came too late. Manfred and Henning have cut it down, so that no more dead branches could fall onto the road. They have a wood stove, we don't have to hire a professional lumberjack and dispose of the wood. A typical win-win situation! Skoolie left us with its new owner to Bavaria - and then on holiday to Croatia - in the course of this year. Back in Regensburg, Matthias found a leak in the water heater, so he had to take out part of the floor. This at the same time gave him the possibility to adapt the lay-out to his wishes for a mobile living/working space. The shed now offers ample space for the Wanderlodge (for longer trips) and the small van (for quick, short trips). The Wanderlodge constantly needs some attention, the consequence of a 40 year old vehicle. As from May, Ernst has picked up Hebrew again, with an Israeli teacher in the synagogue in Oldenburg. Incredible how fast one forgets everything one has learned, if one does not use it on a daily basis! Motek has experienced a violent giardia infection. But after just one cure of Metronizadol he was back to normal. And apparently our disinfection measures were sufficient to prevent a new infection. As from the end of September Rebecca stayed on our guest floor for six weeks. Between Motek and Rebecca it was love at first sight. Through her presence we managed to attend the various High Holidays services in shul together, which otherwise is not possible because of Motek. 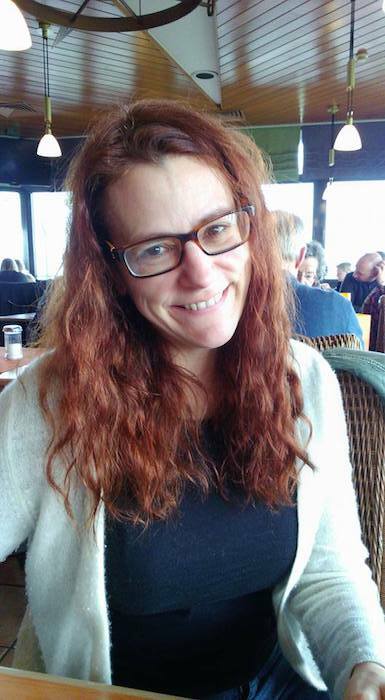 She came as an unknown dog sitter, but left as a dear friend. Kristallnacht is commemorated very seriously in Germany. Ernst took part in the cereemony on November 9 in Wildeshausen and on November 10 in Oldenburg. After four consecutive Škoda Octavia Combi diesels, we switched to a Mitsubishi Outlander PHEV. The first 50 km we drive electrically. When the sun is bright we charge the battery using our own photovoltaic energy. Fully electric cars were not eligible because they have too small a radius for our Dutch destinations and / or can not accommodate Motek. Joop Hinke managed to find our yard as a stopover. 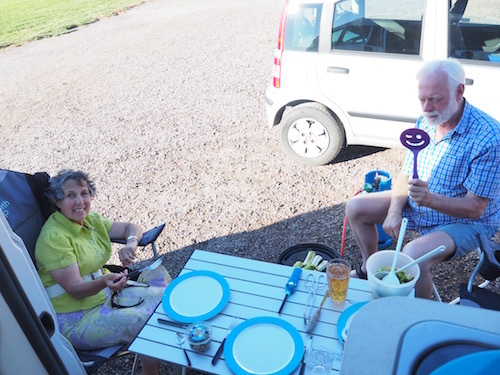 Also Arianne, Henk Paul, Hélène, Fred, Elma, Linda and Hans came to see us, some of them underway from the Netherlands to Scandinavia. Looking back 2016 has been a colorful year. Now on to 2017!